"If Bava had been making pictures in the United States, or even in England, Bava today would be known as the equal of Hitchcock." 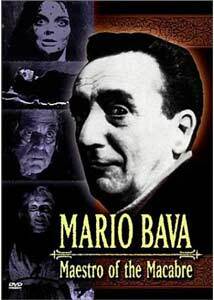 Mario Bava, thanks to DVD, has finally started to receive proper appreciation in the United States. But he's long been well-known to filmmakers, having influenced directors from Joe Dante, John Carpenter and Tim Burton to Martin Scorsese. Ever the consummate visual stylist, his influences have ranged from horror and suspense to big budget spectaculars. This hour-long documentary takes a look at the career and the works of Bava. As is to be expected, the documentary alternates talking heads and film clips. Many notable directors are interviewed with obvious joy in being able to recount Bava's influence upon them. Bava biographer and Video Watchdog editor Tim Lucas also makes a substantial contribution, as does Dr. Linda Williams, a British film scholar. Heavy emphasis is of course given to Bava's first great masterpiece, Black Sunday and his classic anthology, Black Sabbath. While discussing Bava's seminal contributions to the genre of the giallo, with substantial excerpts from The Girl Who Knew Too Much and Twitch of the Death Nerve, the filmmakers somehow skip over Bava's truly essential contribution to the shaping of the genre, Blood and Black Lace. The omission is truly curious. The documentary concludes with a look at the troubled production of Lisa and the Devil, the hugely influential Planet of the Vampires (Alien was lifted wholesale from Bava's film) and the comic-book adaptation, Danger: Diabolik, the latter being the only major Bava work not yet represented on DVD. The omission of Blood and Black Lace and short shrift given to numerous other pictures is particularly irritating in light of much time wasted on Roman scenery and clips from Friday the 13th Part II, Alien and Sleepy Hollow. Though Bava's influence is plain, it could have been conveyed with much shorter clips than are used here. One feels as if the emphasis is shifted away from Bava and his own works onto his imitators, which may be appropriate for a six-hour miniseries, but not for an hour-long documentary. While the content here is very good, it could have been much better and the results are slightly frustrating. Equally frustrating is the omission of any interview footage with Bava himself; this provides a very secondhand feel to the proceedings. Image Transfer Review: The picture quality, as is to be expected, is rather a mixed bag. The interviews all look perfectly fine, as they should. Most of the film clips are on the dupey side. Caltiki, the Immortal Monster is taken from a video master with prominent scan lines obliterating any picture detail that might have survived. Surely there had to be a film source for this? Audio Transfer Review: A 2.0 Dolby Surround track is provided, and imaginative use is made of the surrounds. The audio is practically hiss and noise free, and sounds quite clear throughout. There is a surprising amount of low bass available here, and the viewer's speakers will get more of a workout than you might expect in a documentary. Extras Review: No extras at all. One would think that at least a filmography would be mandatory on such a release, but none is to be found here. At least the chaptering is adequate. Mario Bava gets some of his due in this earnest and well-intentioned documentary that has an unfortunate tendency to get sidetracked. Picture and sound quality are generally quite good, though some of the clips are only fair. Definitely worthwhile for anyone wanting to learn about how Bava has influenced other filmmakers.